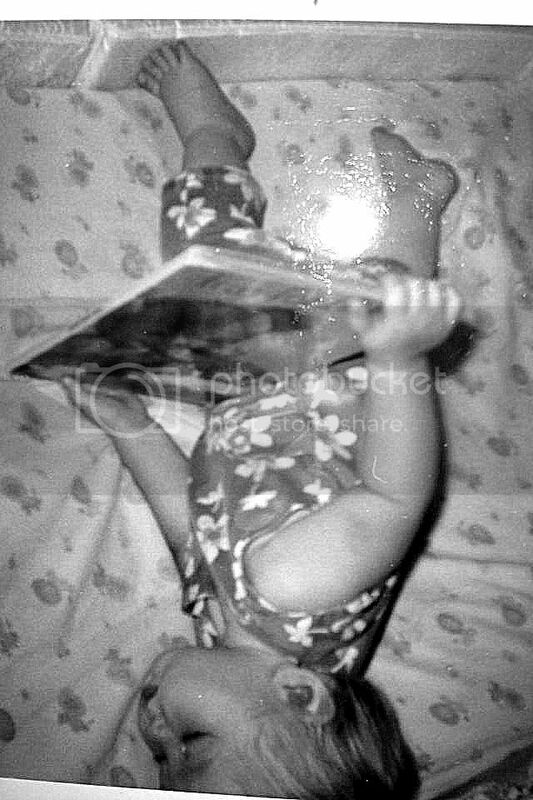 I'm trying to identify an English-language book by its cover as seen in a photo of my friend taken in 1970 when she was a year old. The original image is hard to make out, but I inverted it and made it black and white. Does anyone recognize it? I think the cover shows a bear, and it looks like art from the 50s or 60s. I've tried every search I can think of combining the words "bear vintage retro book cover children's 60s 50s 40s" and am coming up blank. It almost looks like the bear's name is Matthew or Manfred or Harfeld or Hatfeld...but then my eyes start crossing. My only hope is that someone might recognize it from that same generation. At first blush I thought The Poky Little Puppy. 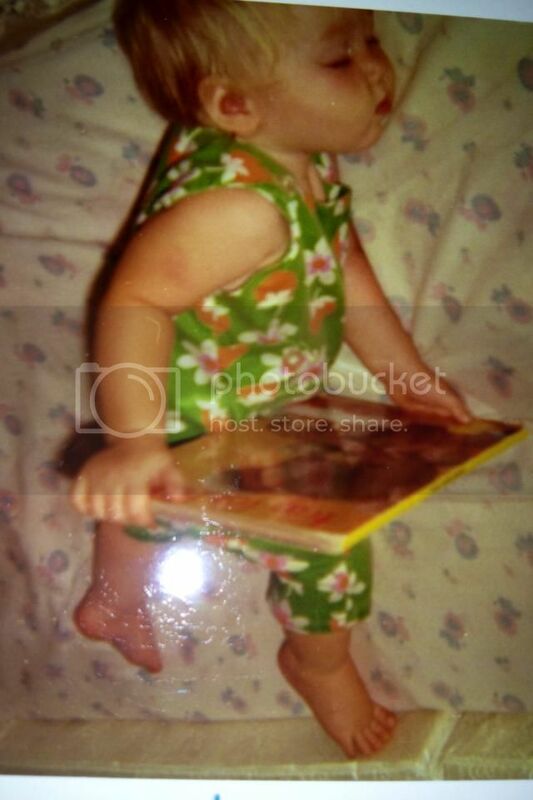 It's a little golden book and EVERYONE had it. And their dog. I don't know what it is, but I wanted to say that it doesn't look like a bear to me -- it looks like a man in a Russian-style hat. It does kind of look like a man in a hat at a table, but I don't know the book. This site seems like it has some other avenues to try, in case another Mefite can't help? If you look - the spine is visible, I think the picture shows the back cover of the book. Wait, no. Sorry ;) I think it's a bear though. To me, it's a figure bent over a workbench, like a cobbler, woodworker, toymaker, etc. I thought it looked like a man in a Russian-style hat (or even a gnome?). I skewed it in Photoshop. It's still very unclear, but I think this proves it's a teddy bear. Possibly with a birthday cake? I think it's a man or woman wearing a Cossack-style hat on a horse--if you look in the B&W version there appear to be reins, or perhaps he's holding a sword. This site has some resources for researching children's books. Another vote for teddy bear and birthday cake. That skewed image definitely sets off the bear/cake (I was previously going to say it looked like a patchwork elephant). Could be a picnic basket as well as a cake. Is it definitely a book? It sort of looks like a coloring book. I could swear from showbiz liz's skew that the first two words of the title are "Tea for" but google image searches for "tea for teddy" and "tea for bear" turn up nothing. My work search history is now a mix of "bear birthday picnic children's book" and like "palestine united nations justice activism," hope you're happy OP! Looks like a bear with a drum to me. This is quite a delightful puzzle! And though I cannot solve it, may I add that I thought the picture was of a chimpanzee or a monkey on a branch, with the title being "Tree for M..."
It looks like a teddy bear pouring a cup of tea to me, especially in the b&w inverted one. Can't make out any letters on the title, though. Or birthday cake. I see the birthday cake, too, now. But definitely a teddy bear. Could your friend take another photo of the photo, this time angled so that the flash isn't hitting the book? It looks like the bear is dressed in old fashioned military garb...or a marching band outfit? Children's lit pedantry: Francis is actually Frances and is a girl. She's a badger. But the photoshop by showbiz_liz is pretty clear that it's not Frances. She's black with white facial stripes & doesn't have the big round ears you can see in the photoshop. Francis is actually Frances and is a girl. She's a badger. Wait, Francis is a BADGER??? I always thought Francis was a bear. You know, with the jam and all. Yes, in the picture showbiz_liz posted it is definitely a teddy bear, sort of the traditional brown fuzzy variety. I think it's Trafalgar bear. Oh, I'm thinking of Paddington Bear. Never mind. This is like every single episode of CSI. Only with teddy bears. Only infinitely more realistic. "Enhance! ...Ok, I still have no idea WTF I'm looking at"
I am convinced that the title says "Hat for..." and then it's covered by the child's hand. When I typed that into google, it completes the phrase with "Ivan" and I got excited since some people were thinking it had a russian hat. But that's not it. So now I'm scrolling through google image search using "hat for" bear picture book, and oh my this is a nice stroll down memory lane. And a nice peek into folks who knit hats shaped like animals :-) I haven't found anything, but I thought my ideas might help someone else. Remember, not everything is on the internet. 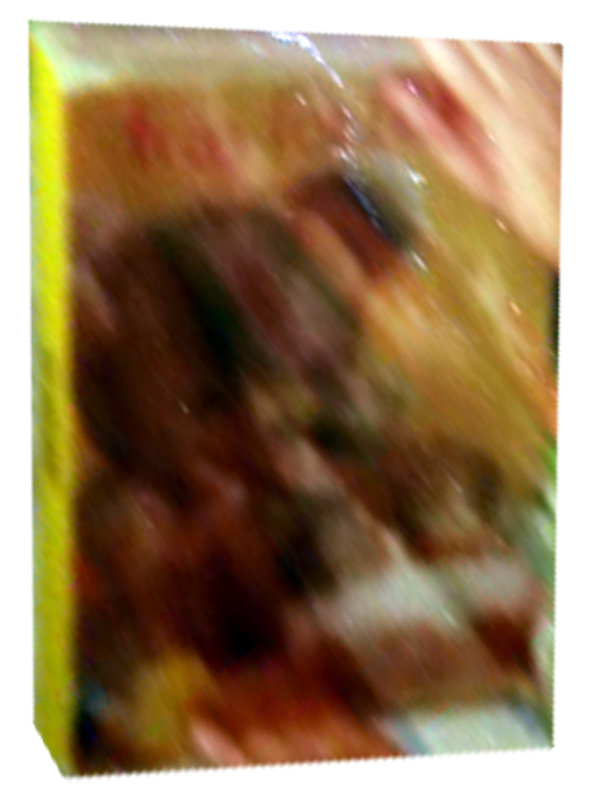 I think your only chance is for someone to recogonize and remember it from the blurry (but nicely reconstructed) photo. To me it looks like a bear with reading glasses and two kittens(?) in a bassinet in front of it. Maybe the bear is reading them a story? The yellow spine looks significant -- not a golden book, but does that belong to a particular series? If not a golden book it looks to be about the same size: maybe something like 6" x 8" x 1/4." The title looks to me like "f?a? fo? ????" I agree with suedehead that a higher quality scan of the original photo might be very helpful. The first word looks like "Tray" to me, as in tea tray. After looking for 'Tray', what I now see is 'Pray for P...' with the loop of the first 'P' not showing up properly. My interpretation of the title is that it says something like "B is for Bear" or "C is for Cake" or "B is for Birthday", but the last word has the hand in front of it. There's a zillion books with those titles, and I didn't see this cover among them. I'd give a shot to "Pray for..." with the chance that's it's still a bent over figure rather than a bear. I agree on the bear and the cake, but don't see "Tea" or "Hat", and I'm having a hard time even guessing what the words might be. TinEye searches with the enhanced images from showbiz_liz and Mapes didn't yield anything. Wow. Thanks so much for your efforts, everyone. The photo doctoring showbiz_liz and mapes did was more than I was able to manage. Mostly I was just blown away that what I saw as a bear can also look exactly like a man bending over (reminds me of the "do you see a young woman or an old woman?" illusion). I don't think I can get a scan of the photo. My friend's mom is in another state than her, and took a photograph of the photograph (hence the glare and blur) and her mom's computer skills are rather limited. peep, it is definitely not a coloring book, my friend's mom confirmed that much. Could well be "pray" but my friend's family isn't particularly religious, though of course that doesn't rule out the possibility of that being in the title since we are in the south. It looks like a birthday cake and drum alternately to me, I just can't decide. I do think it's a bear, but I am not positive about that either. Anyway, I am going to continue trying to find out on my own using the site recommended by jetlagaddict and megancita and trying various ideas based on your suggestions. I best-answered a few of you but if I am able to find the answer at some point, I'll come back and best-answer more. And if the thread is still open, I'll post the answer as well! Thanks so much everyone. Metafilter is such a great place! Looks like a bear with a drum, holding two drumsticks, the one in his left paw is pointing upwards. Otherwise it could be a birthday cake with one candle in the middle, or a mixing bowl and wooden spoon. Could also be a bear sitting up in bed. There is definitely something poking up over the bear's left shoulder. The spine shows three words about this long ---- --- ---. The cover looks like cardboard and it could even be one of those baby's books that have cardboard pages. Are you sure it's in English? If it were German the first word could be Frau. Could also be That or The. Looking at it again, it could be 'The Three Bears' with a bear eating porridge from a bowl.